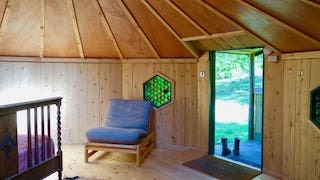 This amazing all-wooden yurt has been hand built by a local craftsman on site to our specification. 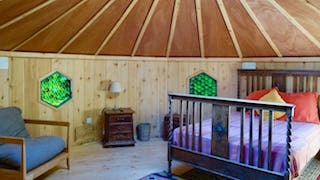 The yurt has a large double-glazed dome skylight which is perfect for star gazing from your bed. There isn’t another one like it and it has proven huge popular to new and returning guests alike. Ash Yurt is prefect for glamping weekends, or an introductory yurt break for guests who want something different to a traditional Mongolian Yurt. As with all our yurts there is a woodburner inside and outside is a BBQ, picnic bench and your very own firepit. 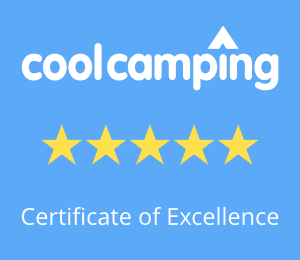 The yurt is fully furnished with rugs, cushions, one standard double bed and two single futon chairs so is ideal for a small family or a couple. There is also electric lighting and a USB port for charging your phone. 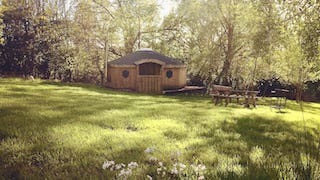 This yurt sleeps a maximum of four people including children. The maximum number of adults in this yurt is three, but please call to discuss if there are more. Click here for Ash Yurt availability, booking and pricing information.